If you work in the healthcare industry, chances are pretty good that you’re very busy. Hundreds of thousands of people depend on the hospitals, doctor’s offices, and dentists in their communities for their quality of life. Sometimes they visit a facility because they need a routine checkup. Sometimes one of their children is sick and they’re scared. Sometimes they’ve broken a limb and they’re in terrible pain. Sometimes their very lives depend on the help they get. Medical care has high stakes, and it can feel like every place you turn, there’s a possible mistake that could deeply damage (or even end) someone’s life. Both staff and patients are at risk here. Fortunately, medical regulations and processes have come a long way. In fact, all it takes is going back a hundred or even fifty years to realize how great our progress has been. 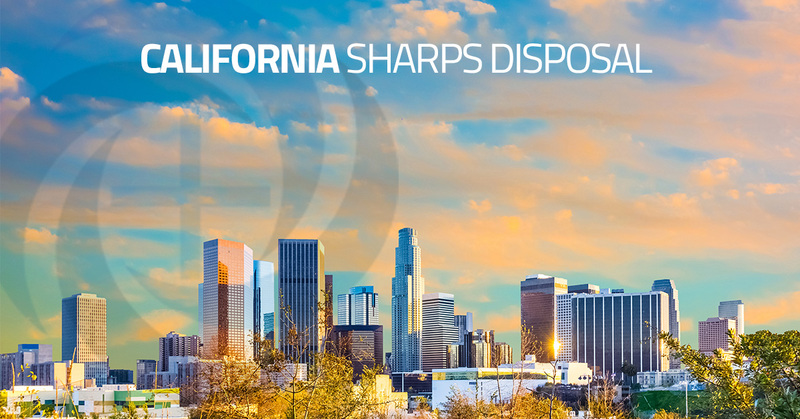 There is always more progress to be made, and that is why the team at Medical Waste Disposal makes a point of knowing exactly what the state and federal regulations for sharps disposal and medical waste are at any time. As a team trusted by California practices to pick up their hazardous medical waste and dispose of it properly, we understand how important our work is to the success of these practices, and we take the responsibility very seriously. When people hear “medical waste,” they immediately think of hospitals and doctor’s offices. However, the range of businesses we serve is a lot wider than that. We serve urgent care centers, blood banks, veterinary offices, and even morgues. Why? Because all of these places produce waste that is extremely harmful to the environment and very dangerous to communities. In our years of experience with a wide array of businesses, we’ve seen that every single one of them is different. We’ve also seen common mistakes that practices make when it comes to medical waste, and we want to do our part to help them steer clear. 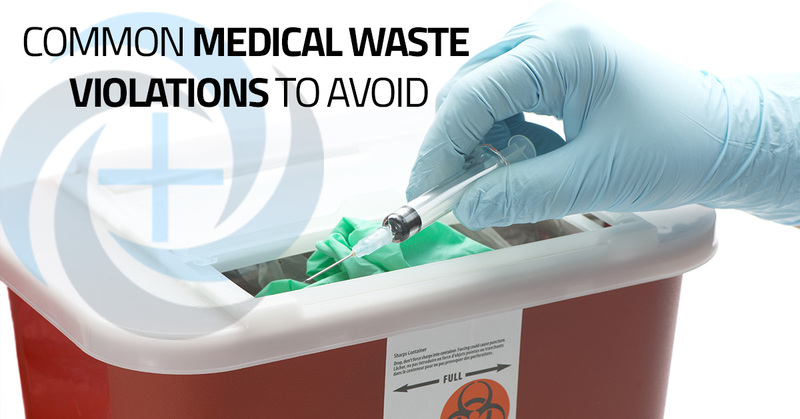 Medical waste containers allow facilities to organize their waste instead of outputting giant messes of hazardous materials that are impossible to manage. Why is organization so important? Because different types of medical waste require different disposal methods. Some must be incinerated, some must be sterilized before being incinerated, and some have to be buried. Even the ashes of burned medical waste have special disposal requirements. And these requirements aren’t there “just because”; they exist because they’re the only way medical waste ends up in a place where it doesn’t present a risk to the environment and the communities around it. The following are mistakes we see when it comes to containers, and they are the kinds of mistakes that can really get your practice into trouble. There are many specific requirements around labels. That makes it easy to mess them up. Sometimes we see practices using the wrong colored bags or failing to use Date of Accumulation labels, which makes it next to impossible to dispose of your medical waste correctly. It gets more difficult when you add up the sheer number of different containers medical professionals have to use on a daily basis. The only way to combat this issue is to stay vigilant and emphasize the importance of proper label usage. 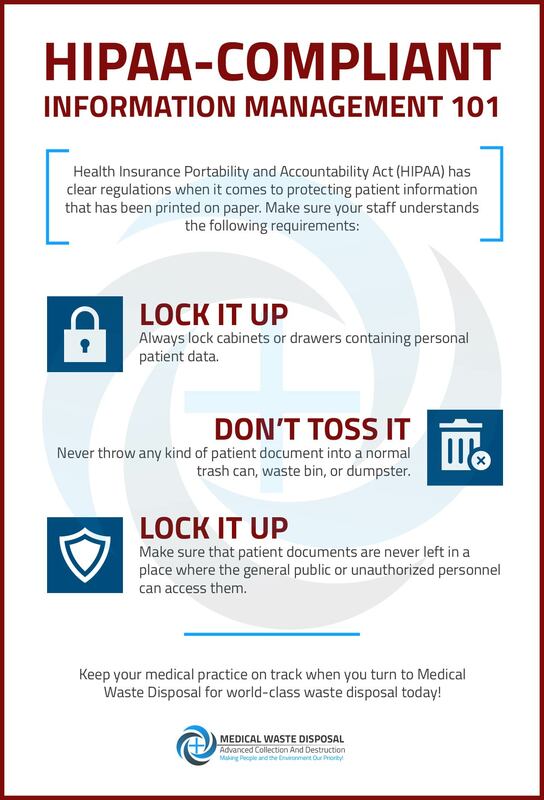 Medical containers are designed to protect employees and patients from medical waste, and when they’re used incorrectly, the situation can be pretty dangerous. One of the most common examples is putting sharps into the wrong containers. Because sharps can pierce the skin, they can easily spread nasty diseases and chemicals. If any type of sharp ends up in a non-rigid container, all it takes is someone grabbing it in the wrong spot, and they could get a used needle through the hand (and infectious material in their bloodstream). It is important to note that even though medical professionals used to improvise sharps containers from milk or detergent jugs, that is no longer allowed. You must use Department of Transportation (DOT) certified reusable containers, which are both tamper-proof and leak-proof. Beyond sharps, even used bandages or empty medication packaging can be dangerous. And even if no one touches the hazardous waste en-route to a disposal center, putting waste in the wrong container means it won’t be disposed of correctly. Understanding what goes in each container (and what doesn’t) is extremely important for your whole team. Even if your containers are certified by DOT and you have them labeled correctly, they need to be monitored to ensure they are in good shape and are being used correctly. You should inspect them every week, and the inspection should be documented with a date and the initials of the inspector. If your facility requires weekly fire extinguisher inspections, it’s easiest to add container inspections to that route. Make sure that the inspections aren’t neglected as they are one of the only ways for you to know how your containers are doing. Additionally, if you run into a contamination situation and legal action is being taken against you, having careful inspections records will be a good thing to have on your side. A medical waste container that is open even a little bit is an immediate violation. The law dictates that all containers be kept closed and latched at all times. The only time that can change is when waste is being removed or added. They have to be kept closed in order to ensure infection doesn’t get transmitted. After all, a container that isn’t sealed can’t do its job, and it’s a big violation that can get you into trouble. Keep in mind that containers with damage, tears, or holes count as “open” containers and should be replaced immediately. Any handling of a container that causes it to rupture or leak counts as an immediate violation. That means, if the container is too heavy to carry, a truck must be used. Don’t pile up a bunch of small containers to the point where they will fall over. Care is absolutely essential every step of the way. No medical facility is immune to the unexpected. Whether it’s an accidental spill or the loss of containment, the best way to prevent your facility from being vulnerable in out-of-the-ordinary situations is to have well-crafted and clearly-communicated emergency plans. Whatever emergency plan you come up with must be sent to your local authorities and posted beside a telephone on your site. And it isn’t enough to make a plan and just leave it; you need to update whenever your facility undergoes a change. Even if nothing changes, the plan needs to be updated every year. Failing to distribute the plan to your team – simply posting the plan on the wall is not enough. You should provide copies to every single employee who deals with hazardous waste and have a meeting to go over every part of the contingency plan. Keep everyone updated whenever the plan changes. Failing to fulfill details in the plan – Your plan might require bags or other containers that are held back until they are needed. These are like lifeboats on the Titanic. It isn’t enough to make a plan; you need to have enough “boats” to handle any emergency. Letting plans get out of date – failing to annually review your plan puts everyone at a disadvantage, especially if things have changed in your facility (or laws have changed). When the unexpected happens, people will turn to the plan available to them, and it needs to be up-to-date. Failure to tailor plans to your current operations – What works for one facility may not work for you. You need to take the policies and regulations and make sure they translate into your facility. Additionally, you should make room for growth in your facility’s output of medical waste. At Medical Waste Disposal, we are happy to help you create feasible, complete, and updated contingency plans for your facility. We can address how to communicate hazards, prevent fires, control exposure, and general emergency preparedness. All medical facilities produce hazardous and non-hazardous waste. Making sure the two don’t mix is very important, because one goes to specialized facilities and the other is just dumped into the landfill. The first step to getting a hold on your facility’s waste is to test it with full knowledge of what is hazardous and what is not. Your entire team should know the difference by heart. However, while people tend to be able to identify hazards like needles and medications, they sometimes forget that bloody cotton swabs or bandages count as hazardous waste. They should never go into the ordinary trash, but they do far too often. As you consider your facility’s waste, you’ll probably become aware of a third category: non-medical hazardous waste. This waste cannot go in the normal trash and it can’t go in your medical waste, either. In fact, putting it in your medical waste will quickly get you fined and even put in jail. This type of waste includes solvents, paints, thinners, batteries, formaldehyde, and drums of materials that are universally hazardous. Medical Waste Disposal is here to help you identify what is hazardous and what is not – for free. It’s part of our dedication to making it possible for you to take your practice to the next level while maintaining compliance. We consider ourselves to be allies of California’s healthcare and medical facilities, and we love what we do. Contact us to get started today! You can have phenomenal medical waste procedures and plans, but they are only as good as the people using them. If the people cut corners, your procedures are no longer that great, and your whole team can get into trouble. Modern medical waste procedures are rooted in the Occupational Exposure to Blood Borne Pathogens (often called the BPP Standard). The BPP Standard was introduced by the Occupational Safety and Health Administration (OSHA) in 1991, and it dictates how regulated medical waste must be identified, segregated, and managed. All employers are responsible for ensuring any of their employees with occupational exposure have the training to protect themselves and their patients. Training is your only hope of avoiding common violations, and you have to document the training you do. 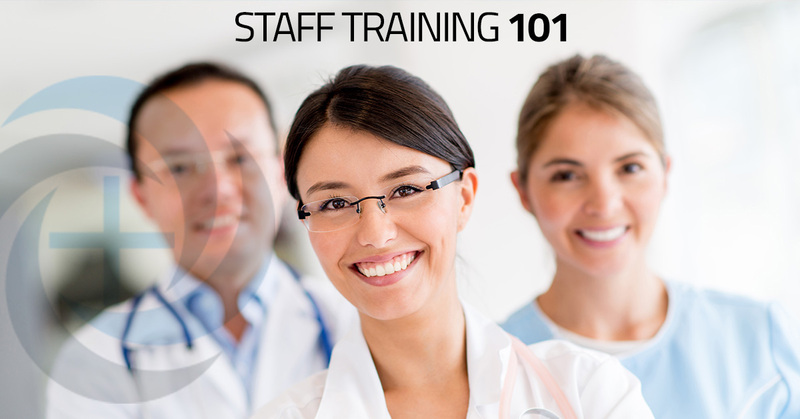 If employees are not trained, it creates a dangerous and costly situation for your practice. The employees themselves are at risk, the patients they treat are at risk, and you are at risk for losing your reputation, thousands of dollars, and even your entire practice. The DOT does audits, and when they come through your practice, they will question your employees to learn how much training they received when they began and how much training they receive throughout the year. They will ask them about how to handle different materials and expect them to know the correct answers. If your employees cannot answer the questions correctly, your facility will be cited for non-compliance. The biggest area where employers fail is providing consistent training. Sometimes they try to do it themselves to save money. They think that going through some training materials is enough, but choosing this direction usually results in employees who fail to follow through. It is better to bring in a medical waste disposal service like ours to train staff. We are completely up-to-date on current regulations, and when things change, we’re the first to know. Let us save you money and liability with effective training in California! There are many different types of waste that cannot be disposed of in traditional trash cans. The key is being able to differentiate between them all as well as train everyone on your team to do the same. All too often, part of the team understands dangerous waste, and that isn’t enough. All it takes is a mistake by one well-meaning worker who doesn’t fully understand what needs to be done, and you can have major health and business consequences on your hands. There is no such thing as a minor mistake when it comes to medical waste. The good thing about our modern medical world is that we actually know that its waste is dangerous, and we’ve put in the work to create systems for disposing of it correctly. 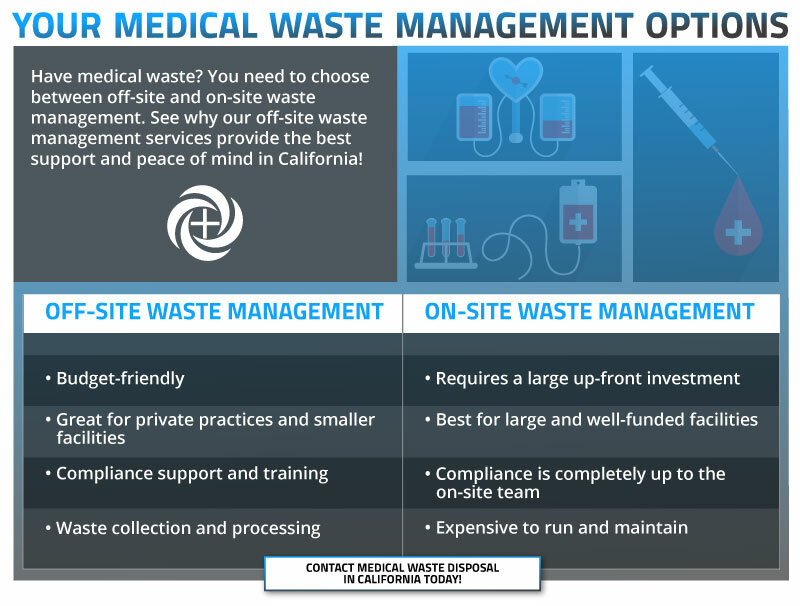 The team at Medical Waste Disposal is here to make that happen for California practices. In today’s blog, we want to explore a little medical waste history and some of the main options practices have when it comes to their own dangerous waste. The management of biomedical waste made some significant improvements in just the past few decades. The big changes were prompted in the 1980s when medical waste washed up on several beaches. The incidents were highly publicized and created a major public outcry. As a result, the Federal Medical Waste Tracking Act was put into place in 1988. It introduced and enforced stringent waste transportation standards for healthcare facilities. In 1991, the act expired. However, the lessons we learned from the act have stuck and state agencies now enforce the standards. To this day, improved waste management solutions are being developed to improve speed, safety, convenience, and cost. This budget-friendly option is very helpful for private practices and smaller facilities. It is a service that Medical Waste Management is proud to provide to California. When you choose off-site waste management, a waste collection firm like ours has a treatment facility of our own. We come to your practice, train your team to ensure compliance, collect your waste by mail or truck, and then treat the waste we collect so you do not have to worry about it. This option provides you with allies dedicated to keeping the medical waste side of your practice correctly regulated and safe. If a healthcare facility is large and well-funded, it can make sense to have biomedical waste equipment on-site. This type of equipment doesn’t come cheap and requires plenty of time and money to run. The on-site team is also completely responsible for adhering to regulations. While have the whole process under one roof can provide peace of mind, it’s also a big responsibility. Medical waste can have a serious impact on your practice. Don’t let it drag you down. Turn to Medical Waste Disposal in California for convenience today! Copyright © 2018 Medical Waste Disposal. All Rights Reserved.